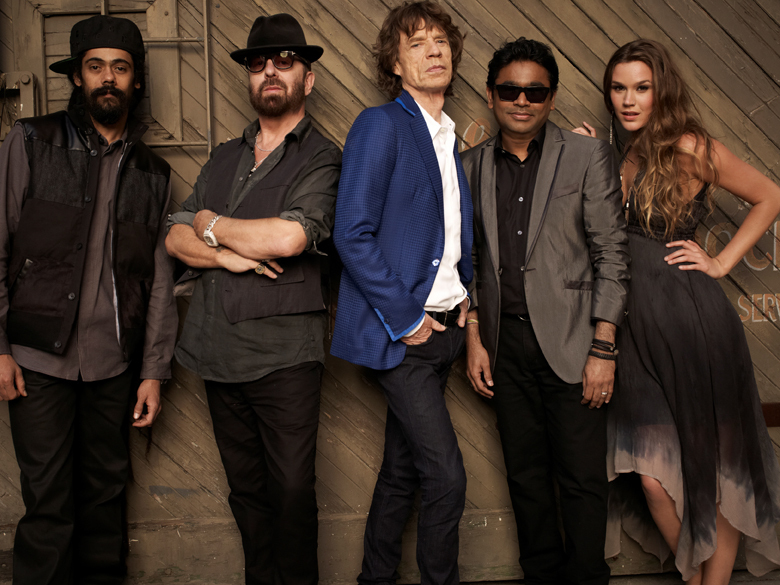 Mick Jagger has teamed up with Eurythmics founder Dave Stewart, soul singer Joss Stone, Academy Award winning composer and global superstar A.R.Rahman and reggae star Damian “Jr Gong” Marley to form a cooperative project called SuperHeavy. Surfdog/DKM founder, Dave Kaplan, executive produced SuperHeavy along with Irving Azoff. It’s little wonder that Stewart refers to SuperHeavy as, “A mad alchemist type experiment“. Fusing the talents of one of the greatest front-men of all time, a two time Academy award winning Indian composer, a soul vocal prodigy, a three time Grammy winning reggae star, and one of the most sought after producers in the world, you would expect the explosive results to defy categorization. 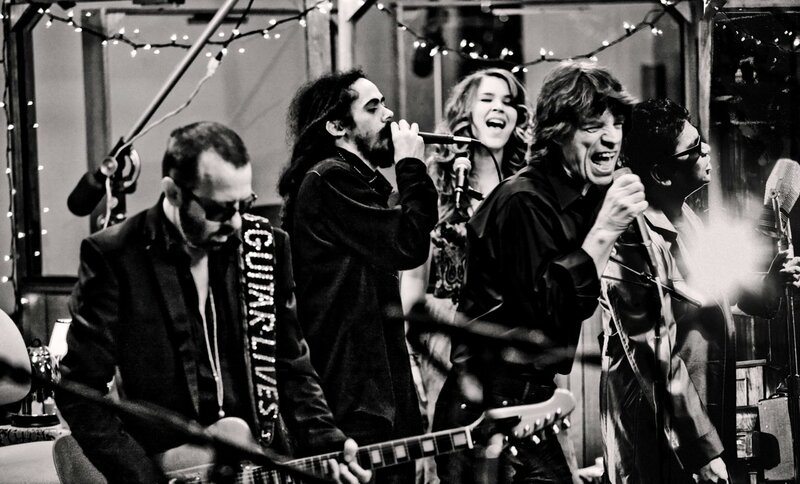 Yet soon enough Jagger found himself back in the studio with Stewart and Joss Stone, having previously worked together on the 2004 Alfie movie soundtrack. Stewart says Stone was, “an obvious choice for us. She’s such an incredible singer and spirit.” Stewart and Jagger’s dream team took further shape when they were inspired to bring Damian “Jr Gong” Marley into the mix, says Stewart, “We’d always wanted a Jamaican musician because Mick and I are crazy about Jamaica and Jamaican music.” Stewart has worked with legend Jimmy Cliff while Mick has duetted with Peter Tosh from the Wailers on the Temptations tune “Don’t Look Back” in 1978. “We were listening to loads of stuff and suddenly a light bulb went off and we thought about Damian “Jr Gong” Marley.” Jagger had long been a fan of Marley’s, fresh from another cross-genre collaboration with American rapper Nas, citing his strength as a lyricist and toaster along with his penchant for experimentation and collaborative spirit. Marley brought on board his rhythm section, bassist and composer Shiah Coore and drummer Courtney Diedrick, while Stewart introduced the band to his long-term collaborator Ann Marie Calhoun, a rock violinist who had previously worked with the Foo Fighters. The band found a harmonious way of working together, “With five of you everyone has to give and take quite a lot. We tried to understand everyone wouldn’t be too egotistical, start throwing things around the studio, we wouldn’t have fights!” says Jagger. However they weren’t averse to telling each other to be better either, Jagger continues, “We were writing a lot of stuff and throwing it away. 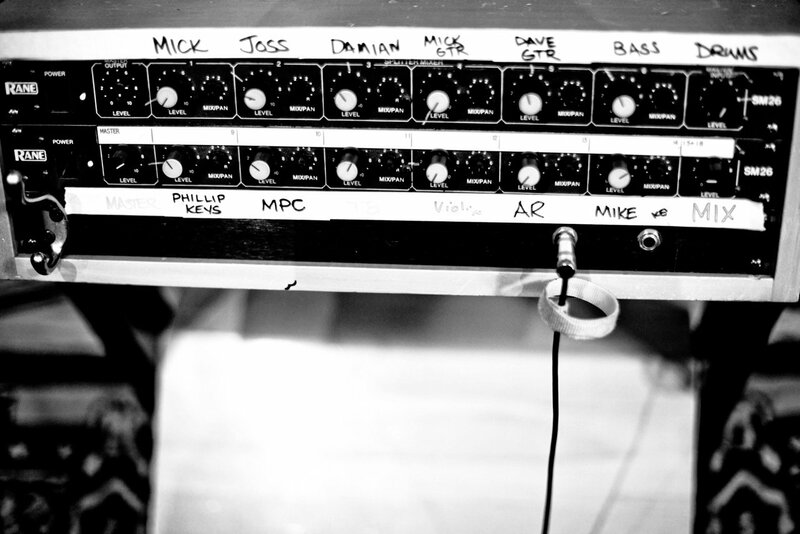 I would say, ‘That’s rubbish, another cliché Joss’, and she’d say, ‘Well you come up with something then!” The experience was refreshing and exciting for the band, “We’re four vocalists and we’ve never worked like that before. It’s great because the whole burdens not on you, and that made it fun.” Jagger enthuses. Marley’s way of working was different to the rest of the band. Stone reveals, “Damian is kind of quiet but he has some brilliant ideas. He works on stuff at night. Sometimes he’ll just go away and sit with the lyrics and bring something to it. His rhythm section brings so much. He has his own thing going in the next room so I pop in and out.” Marley would work on toasting over the record by himself and re-join the band when he was happy with it. The striking artwork that graces the front of the SuperHeavy album is the work of Shepard Fairey, the artist responsible for the iconic ‘Hope’ poster used in Barack Obama’s successful election campaign. Mick Jagger is rock’s premier frontman and one of the most popular and influential British musicians of all time. Instantly recognizable as the iconic lead singer with the Rolling Stones, the greatest rock’n’roll band in the world, he has set standards for performance and creativity that remain unmatched to this day. Dave Stewart’s music career spans three decades and more than 100 million album sales, highlighted by his collaboration with Annie Lennox in the groundbreaking pop-rock group The Eurythmics (“Sweet Dreams [Are Made of This]“, “Would I Lie to You?” and dozens more). Behind the scenes, he’s produced albums and co-written songs for Stevie Nicks, Tom Petty, Bono, Sinead O’Connor, Mick Jagger, Katy Perry, Jon Bon Jovi and a host of others, racking up numerous Producer, Songwriter and Grammy Awards along the way. 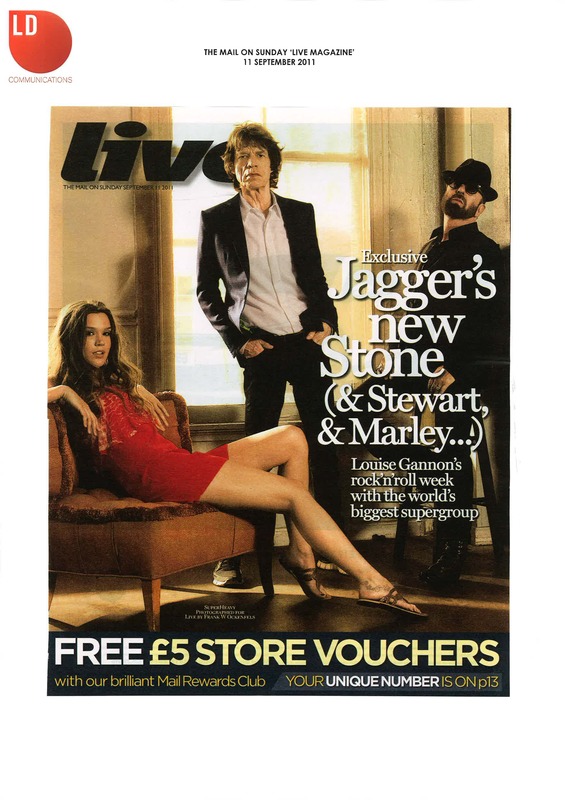 Joss Stone has been obsessed with soul music since she was a little girl. By the time she was in her early teens she had begun to intuitively hone her now trademark gravely-but-lustrous vocals by singing along to Aretha’s Franklin’s Greatest Hits. She began pursuing a singing career at thirteen, when she auditioned for UK talent show Star For a Night. This eventually led to a record deal and the release of Stone’s star- making debut album, ‘The Soul Sessions’, in 2003. Her second record, 2004′s ‘Mind Body & Soul’ earned Stone three Grammy nominations and was followed by 2007′s ‘Introducing Joss Stone’ which achieved the highest debut billboard chart position for a female British solo artist. Though his debut album was released in 1996, Damian “Jr Gong” Marley had been honing his skills as a singer, MC, songwriter, lyricist and producer since long before then, performing both with a group and as a solo artist from the age of 13. His breakthrough album ‘Halfway Tree’ won Marley his first Grammy in 2002. This was followed in 2005 by ‘Welcome to Jamrock’ which received two more Grammys and featured the massive single of the same name. In 2010 Marley released ‘Distant Relatives’, a collaborative album with the American Rapper Nas which confronted the plight of the people of Africa. A two-time winner of the Academy Award (Oscar), A. R. Rahman is popularly known as the man who has redefined contemporary Indian music. Hailed by Time magazine as the ‘Mozart of Madras’, Rahman, according to a BBC estimate, has sold more than 150 million copies of his work comprising of music from more than 100 film soundtracks and albums across over half a dozen languages, including landmark scores such as ‘Roja’, ‘Bombay’, Dil Se’, ‘Taal’, ‘Lagaan’, ‘Vandemataram’ and more recently, ‘Jodhaa Akbar’, ‘Delhi 6′ and ‘Slumdog Millionaire’. 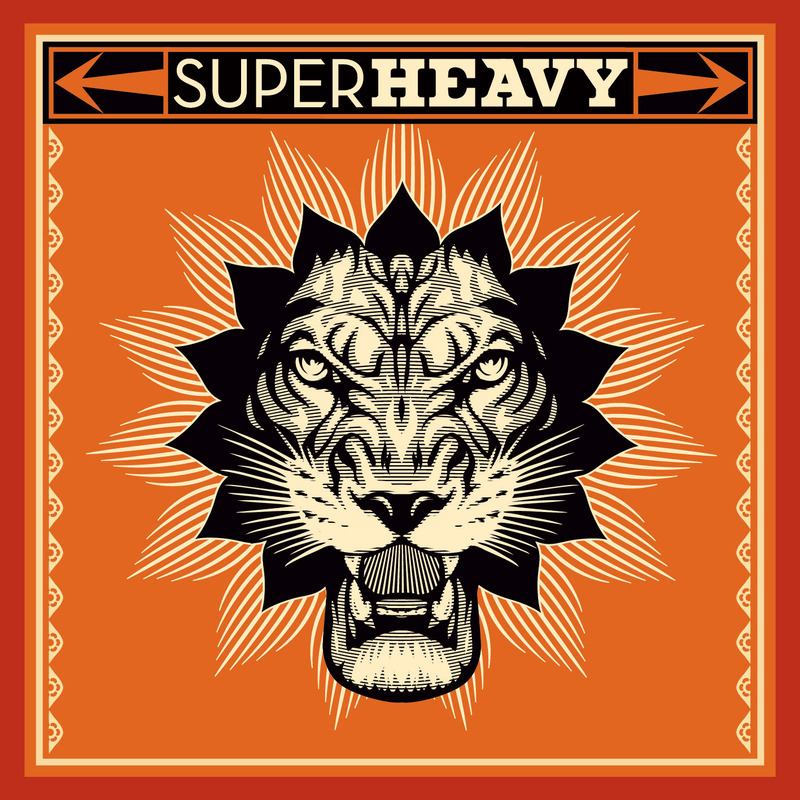 SuperHeavy’s debut album was co-produced by Jagger & Stewart, and out via Universal Music on their A&M label imprint on the 19th of September.